Welcome to our updated class web page. We have re-designed the page to make it easier to open on tablets and smart phones. Note that if you are accessing the page on your smart phone that the index can be accessed by clicking on the three bars at the top right of the page. Let us know if you experience any problems. We have also added more pictures and would still love any pictures you would like to share with your classmates. If you have any questions or suggestions just click the "contact us" bujtton at the top of this page. If you haven't checked out our Pony Express Chatter feature you are missing out on one of the best features of this class web site. You can post messages to your classmates as well as getting caught up on comments and news of your friends. This is also a great place to post your birthday wishes. Our classmate Judy Baumgardner Jordan is a talented artist, She recently had a showing of her art and we wanted to share one of our favorite pieces with you. 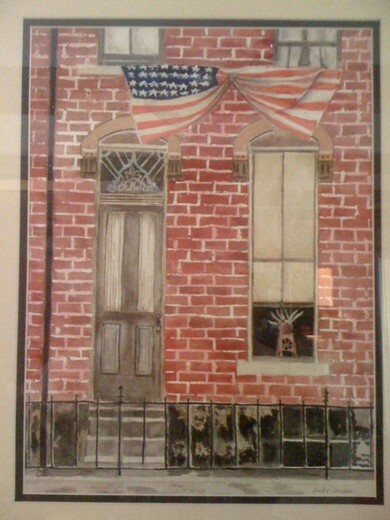 Shown here is a painting entitled "America" that Judy did in honor of her grandson who is serving in the Navy. Judy works in mediums ranging from watercolors to concrete (no kidding). For those of you new to the page, take a moment a read the information contained in the "First Time Visitors" tab on the menu located at the top of the page. If you have any questions about using the site you can also contact us by simply clicking the "Contact Us" tab on the top menu. Don't forget to check the "Pony Express Chatter" for the latest postings by your classmates (and you can add your own posts and pictures). It may taken a few seconds to load but the wait is worht it. Also,be sure to check the "Message Center" from time to time. You'll find the tab in the "Member Functions" section. This is a great (and easy) way to communicate among ourselves without going through e-mail systems. Check it out! We hope you will take advantage of this web site to keep your classmates up to date on you and your activities. If you have any questions about this site, e-mail us at hhs59@earthlink.net or click on the "Contact Us" tab at the top of the page and fill in the blanks. Please let your friends know about the page. The administrators of the class web page are Mike Hoback, Jay Bowen and Barbra Charles Haptonstall. The full web address of this page is http://www.hhs-59.com.Thanks to the vigorous efforts of Tom Lambert, we have been able to add obituary information on our deceased classmates. Note that some advertisements may appear on the page(s). We are allowing these ads in exchange for providing the web service at no cost to us. Register and create your own personal password to gain access to all the features of your website It's easy, free and secure. MEMBERSHIP DISCLAIMER: This is a private site for Huntington High School class of 1959 graduates. Classmates that did not graduate with the class, or that graduated from other years may be admitted on a case by case basis. All membership, regardless of graduating year, will be granted or denied, at the discretion of the site administrator. All memberships may be revoked at the discretion of the site administrator. The privacy and security of all registered members will be considered a priority for the purpose of invitations, admittance, denials and revocations.